گسل کلمرد یکی از گسل‌های مهم بنیادی ایران مرکزی به شمار می‌رود. کوه‌های ازبک‌کوه نیز با راستای شمال ‌خاور- جنوب ‌باختر در شمال بلوک طبس، در ورقه ایران مرکزی در پهنه گسلی کلمرد قرار دارند. بنابراین تجزیه و تحلیل‌ چین‌ها و گسل‌ها در این پهنه دگرریخت شده می‌تواند در درک تکوین زمین‎ساختی این ناحیه از ایران مرکزی مفید باشد. در این مطالعه به منظور ارائه تصویری روشن برای درک تکامل ساختاری منطقه ازبک‌کوه، به انجام عملیات صحرایی و تجزیه و تحلیل هندسی- جنبشی گسل‌ها و چین‌ها و بررسی تکامل ساختاری آنها پرداخته شده است. نتیجه مطالعات نشان‎دهنده آن است که در بازه زمانی قبل از کرتاسه منطقه ازبک‌کوه تحت تأثیر یک رژیم تنش فشارشی با روند عمود بر گسل کلمرد قرار داشته که سبب تشکیل چین‌ها و گسل‌های موازی با روند سطح محوری آنها شده است، سپس با تغییر رژیم فشارشی به راستالغز راست‌بر در زمان سنوزوییک در جهت شمال‌ خاور- جنوب‌ باختر، گسل‌های منطقه و صفحه محوری چین‌ها و دیگر ساختارهای مرتبط با آنها تحت تأثیر این تنش امتدادلغز قرار گرفته‎اند. به‌طور کلی الگوی هندسی و جنبشی گسل‌های منطقه مورد مطالعه با توجه به گسل‌های اصلی و گسل‌های R، P، Rʹ و X از نوع برش ساده و فشارش موازی با پهنه دگرریختی است، که در این الگو، برش ساده الگوی غالب است و فشارش مؤلفه جزئی به نظر می‌رسد. سازوکار گسل‌های منطقه مورد مطالعه نشان‌دهنده آن است که دگرریختی کوه‌های ازبک کوه به سمت مراحل پایانی برش ساده بوده است. 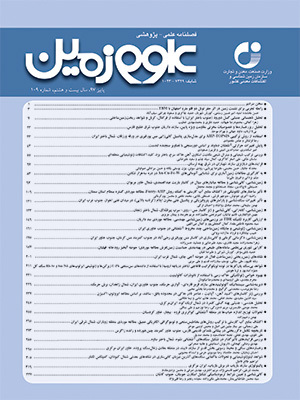 گام‌های متعدد دگرریختی، حرکات برش ساده و شدت دگرشکلی در گستره مطالعاتی باعث شده است تا امتداد همه ساختارها به موازات پهنه گسلی اصلی در امتداد شمال‌ خاور- جنوب ‌باختر قرار گیرند. Kalmard fault is considered as one of the fundamental faults in central Iran zone. The Ozbak Kuh mountains with a NE-SW strike are located in central Iran in the Kalmard fault zone. Hence, analyze the folds and faults in this deformed zone can aid in the understanding of structural evolution of this area in central Iran. In this study, field operations and geometric-kinematic analysis of folds and faults, also study of their structural evolution are integrated in order to provide a better understanding of the structural evolution of the Ozbak Kuh area. The results display that before Cretaceous period the Ozbak-Kuh area was influenced by a compressional regime with a prependicular trend with respect to the Kalmrad fault that it caused the formation of folds and faults paralell to folds axial plane trends, after that compressional regime changing to a dextral strike slip regime in Cenozoic in direction of NE- SW, all structures in the study area such as, faults, folds axial plain and other related structures were influenced by the aforementioned strike slip stress. Generally the geometric- kinematic pattern of faults in the study area regarding to the major and R, P, R', and X faults is kind of simple shear and contraction parallel to deformed zone. In this pattern the simple shear is dominant and compression is trivial component. The mechanism of the faults in the study area shows that the deformation of the Ozbak Kuh mountains is toward the final stages of simple shear. The multiple steps of deformation, simple shear movements and intensity of deformation in the study area caused that the strike of all structures is to be in direction of NE-SW that it is parallel to the main fault zone. مؤمنی طارمسری، م.، ده بزرگی، م.، یساقی، ع. و نوزعیم، ر.، 1394- ارزیابی تکتونیک فعال ازبک کوه در شمال طبس، ایران مرکزی، مجله پژوهش‌های ژئومورفولوژی کمی، دوره 4، شماره 3، صص. ۵۰ تا 69. Allen, M. B., Kheirkhah, M., Emami, M. H. and Jones, S. J., 2011- Right-lateral shear across Iran and kinematic change in the Arabia–Eurasia collision zone, Geophysical Journal International, 184, pp.555–574. Doblas, M., 1998- Slickenside kinematic indicators. Tectonophysics, 295(1), pp.187-197. Fleuty, M. J., 1964- The description of folds, London: Proceedings of the Geologists Association, 75, pp.461–492. Fossen, H., 2010- Structural geology, Cambridge university press, Pages: 463. Hudleston, P. J., 1973- Fold morphology and some geometric implications of theories of fold development, Tectonophysics 16, pp.1–46. Moumeni-Taromsari, M., Dehbozorgi, M., Nozaem and R. Yassaghi, A., 2018- Active tectonics analysis of the Kalmard fault zone, Central Iran, Arabian Journal of Geosciences, 11(14), p.369. Petit, J. P., 1987- Criteria for the sense of movement on fault surfaces in brittle rocks, Journal of Structural Geology, 9(5), pp.597-608. Ramezani, J. and Tucker, R., 2003- The Saghand Region, Central IRAN: U–Pb geochronology, petrogenesis and implication for Gondwana tectonics, American Journal of Science, 303, pp.622-665. Ruttner, A., Nabavi, M. H. and Alavi, M., 1968- Geological map of Ozbak-Kuh Mountain (1:100,000), Geological survey of Iran press. Storti, F., Rosseti, F., Laufer, A. L. and Salvini, F., 2006- Consistent Kinematic architecture in the damage zones of intraplate strike-slip fault systems in North Victoria Land, Antarctica and implication for fault zones evolution, Journal of Structural Geology 28, pp.50-63. Swanson, M. T., 1988- Pseudotachylyte-bearing strike-slip duplex structures in the Fort Foster Brittle Zone of southernmost Maine, Journal of Structural Geology 10, pp.813–828. Sylvester, A. G., 1988- Strike-slip faults, Geol. Soc. Am. Bull., 100, pp.1666-1703. Waldron, J. W., 2005- Extensional fault arrays in strike-slip and transtension, Journal of Structural Geology, 27, pp.23-34. Woodcock, N. H. and Fischer, M., 1986- Strike-slip duplexes, J. Struct. Geol., 8, pp.725-735.